+ On the Air: The 2011 ARRL Phone Sweepstakes Is This Weekend! The Expedition 29/30 crew, shortly after the Soyuz carrying the new crew docked with the ISS. Front row (Expedition 29), left to right: Anton Shkaplerov, Dan Burbank, KC5ZSX, and Anatoly Ivanishin. Back row (Expedition 30), left to right: Satoshi Furukawa, KE5DAW, Mike Fossum, KF5AQG, and Sergei Volkov, RU3DIS. Volkov was one of two Russian cosmonauts who deployed the ARISSat-1 satellite from the ISS in August. Three new astronauts -- Dan Burbank, KC5ZSX, Anton Shkaplerov and Anatoly Ivanishin -- are now onboard the International Space Station. The Soyuz TMA-22 spacecraft carrying the new trio launched from the Baikonur Cosmodrome in Kazakhstan at 0414 UTC Monday, November 14. 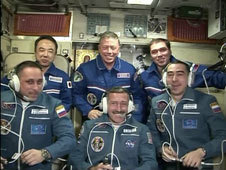 Expedition 29 Commander Mike Fossum, KF5AQG, and flight engineers Satoshi Furukawa, KE5DAW (JAXA) and Sergei Volkov, RU3DIS (RKA), welcomed their new crewmates when the hatches opened at 0739 UTC Wednesday, November 16. Burbank, Shkaplerov and Ivanishin are scheduled to live and work aboard the ISS until March. Read more here. The ARRL Sweepstakes celebrates its 78th anniversary in 2011 and the SSB weekend is coming up on November 19-21. As the CW weekend earlier this month demonstrated, the recent re-awakening of the sunspot cycle promises a generous dose of competition and fun for operators all across the US and Canada. Technician licensees can make the most of their HF privileges by taking advantage of the great conditions on 10 meters! Even very modest stations can do well on 10 meters, including mobile and portable operations. Start tuning on USB from 28.3 MHz and follow the action. If you've never operated a contest before, an introduction to operating in Sweepstakes has been posted online. You can also can brush up on the basics by viewing the 2011 ARRL November Sweepstakes Operating Guide. Assembled by ARRL Contest Branch Manager Sean Kutzko, KX9X, it is a great compilation of Sweepstakes rules, operating techniques, and log submission guidelines. Read more here. Logbook of The World (LoTW) is continuing to accept and process logs. As of November 17, the processing delay stands at 52 hours. There are approximately 1.38 million QSOs in 5886 logs waiting to be processed. If you have already uploaded a log, there is no need to upload it again; by doing so, you will only add to the queue. Do not send entire logs that contain previously uploaded QSOs; please use the date range option when signing logs, selecting only those QSOs in a specific date range to upload to LoTW. Following these guidelines will allow LoTW to process the backlog at a faster pace. The ARRL IT staff continues to investigate an anomalous series of events that began on October 29, initially creating the persisting backlog. The IT staff is also working diligently to speed up the LoTW processing time and eliminate the backlog. Thanks again for your patience. According to predictions from Mineo Wakita, JE9PEL, the ARISSat-1 satellite is due to re-enter Earth's atmosphere in early April 2012. Launched from the International Space Station on August 8, the satellite is traveling in a low orbit and is steadily losing altitude. The rate of orbital decay may be accelerated by increasing atmospheric density caused by increased solar activity. With that factor in mind, some ARISSat-1 decay predictions suggest re-entry as early as February 1. ARISSat-1 remains quite active, sending voice messages, digital telemetry and Slow Scan TV images. Amateurs have also been able to enjoy contacts through ARISSat-1's linear transponder despite the fact that the UHF antenna was apparently damaged prior to (or during) deployment. Last month, AMSAT-NA announced a competition to see who can record the last bits of telemetry as ARISSat-1 makes its final plunge. To decode the CW or BPSK telemetry you must use the ARISSATTLM software for Windows or Mac OS. The CW signal is transmitted at 145.919 MHz and the BPSK signal appears at 145.920 MHz, plus or minus Doppler. NASA is now accepting proposals from US schools, museums, science centers and community youth organizations to host an Amateur Radio on the International Space Station (ARISS) contact between July 15, 2012 and January 15, 2013. To maximize these radio contact opportunities, NASA is looking for organizations that will draw large numbers of participants and integrate the contact into a well-developed education plan. Proposals are due January 30, 2012. Using Amateur Radio, students can ask astronauts questions about life in space and other space-related topics. Students fully engage in the ARISS contact by helping set up an Amateur Radio ground station at the school and then using that station to talk directly with a crewmember on the International Space Station for approximately 10 minutes. ARISS has a network of mentors to help obtain the technology required to host this exciting opportunity for students. Read more here. 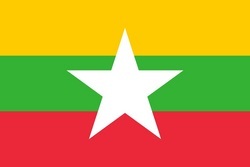 The Daily DX is reporting that Simon Luttrell, HS0ZIB/G6JFY, has been granted an "invitation" from senior officials within the Myanmar Ministry of Post and Telecommunications and the Ministry of Tourism to visit Bagan, Myanmar to operate a four-day PSK31 "micro DXpedition." Myanmar -- formerly known as Burma -- has not been on the Amateur Radio bands since 2004. Although Luttrell does not yet have a formal date for his first operation, his Myanmar contacts want him to "come soon for about five days." Luttrell told The Daily DX that he is hoping to go to Myanmar later this month or in early December, "but must wait for the 'final go-ahead' from Myanmar authorities." Luttrell's initial activity will be on 20 meters only, running about 50 W into a wire antenna. "This operation is intended to be an initial demonstration station," he told The Daily DX, "and my plans for regular 'low-profile' PSK DXpeditions from different tourist locations within Myanmar have been warmly received. Whilst some may scoff at such a micro station, others will be fully aware that a small station of this type can easily achieve global contacts." He said that he hopes that this will be the first of many operations from XZ, as he lives just three hours from the Thai/Myanmar border. Attention microwavers! An ARRL Ad Hoc Committee has been tasked by the Board of Directors with recommending updates to the ARRL band plans for the amateur bands between 902 MHz and 3.5 GHz. If you are now active on any of these bands or are developing plans to become active, the committee would like to hear from you. You can find additional background and a form for submitting information here. Please respond by December 15, 2011. With the switch from Daylight Saving Time to Standard Time, W1AW Station Manager Joe Carcia, NJ1Q, has updated the W1AW operating schedule to reflect the change. The standard times have not changed, but the UTC times have. Read more here. 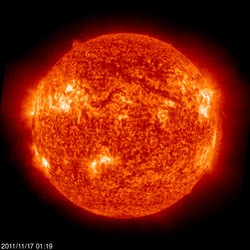 The Sun, as seen on Thursday, November 17, 2011 from NASA's SOHO Extreme Ultraviolet Imaging Telescope. This image was taken at 304 Angstrom; the bright material is at 60,000 to 80,000 Kelvin. Tad "November's Sun is felt by none" Cook, K7RA, reports: This week geomagnetic indices quieted a bit, as did solar activity in general. On November 9, sunspot numbers reached a high of 220, and this week, they declined, rose to 176 and then declined again. The average daily sunspot numbers slipped 8.4 points to 145, while the average daily solar flux dropped 12.5 points to 161.2. The most recent forecast predicts a bit lower activity than we've seen recently. The predicted solar flux from NOAA and USAF shows flux values of 145 on November 17, 150 on November 18-19, 155 on November 20-23, 150 on November 24, 145 on November 25-28, and then rising to 165 on December 4-7, which is just a few days before the ARRL 10 Meter Contest. The predicted planetary A index for November 17-20 is 5, 7, 8 and 7, then 5 on November 21-25, 7 on November 26-27, and 5 on November 28-December 8. Geophysical Institute Prague has their own take, with unsettled conditions November 18, quiet to unsettled November 19 and quiet November 20-24. Look for more information on the ARRL website on Friday, November 18. For more information concerning radio propagation, visit the ARRL Technical Information Service Propagation page. This week's "Tad Cookism" is brought to you by Widespread Panic's Driving Song.